One of the things I was taught very early in altar serving was that your “job” precludes you from the way you might regularly comport yourself at Mass were you simply in the pew. The smooth running of ceremonies depends on your paying attention to all things at all times, making sure that nothing that you or your servers do is unsightly or distracting; you cannot allow yourself to fall into devotion too deeply, or you might miss a cue. This attitude was very much in my mind at the end of May as I witnessed one of the more beautiful ceremonies in the Roman Rite: the ordination of a priest. I was in Verrua Savoia, Italy, the headquarters of the “other Institute,” the IMBC (Istituto Mater Boni Consilii). The Fathers of the IMBC had very generously allowed use of their chapel for the first ordination of an RCI (Roman Catholic Institute) priest, Fr. 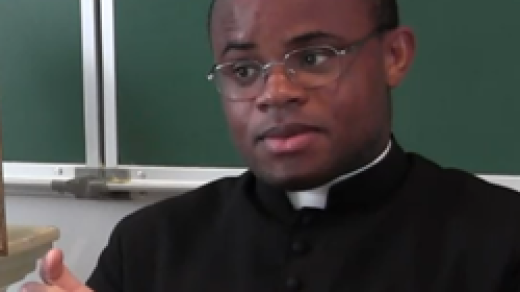 Damien Dutertre. Two of the several owners of True Restoration were with me providing technical support: Matthew Gaskin, co-founder and former head of the RCI UK Mission, and Kristof Csillag, co-founder and head of the joint RCI/IMBC Budapest Mission. We arrived two days before the ordination ceremony, but there was no time to lose in planning the setup of video cameras and photography. In the end, we placed one video camera in the sanctuary with no operator and one camera outside the sanctuary operated by Matt Gaskin. I was roving around, both inside and outside the sanctuary, with a battery of cameras, trying to get as many photographs as discreetly as I could. I’ve attended and filmed multiple ordinations before so I felt that I would be well-positioned to capture special moments to share with the Catholic world. Early dispatches were available on Twitter and our Periscope account (which featured some short live-streamed videos) as well as to our Facebook page and private Member group and our final compilation of the best photos of the Ordination and First Mass of Fr. Dutertre are available here. Bishop: May it please you, O Lord, to consecrate and sanctify these hands by this anointing and our blessing. Bishop: That whatever they bless may be blessed, and whatever they consecrate may be consecrated in the name of our Lord Jesus Christ. Similar emotions gripped Father as he got ready to bless his mother, who with bowed head at the communion rail, did her best to keep her emotions in check as the child she once held in her arms would now bring Christ to all of us each day. Those emotions captured me as well, though I had to check them and remember that I had a job to do. Both Father and I, and surely anyone observing, took a powerful lesson from those moments, and gave thanks to Our Lord for His goodness. Something else quite special is the concelebration that occurs. This is the only time that this occurs ordinarily in the Roman Rite, and as these priests follow along, the celebrant does not use the secret tone that is customary for the Canon, but one that is audible, and so what is normally shrouded in whisper quietly reverberated through the sanctuary and even in the front rows of the chapel. It is a testament to the perfection of the rites of the Church that this practice feels so “normal” within an ordination rite - something that is also an opportunity to teach the faithful - but so out of place ordinarily. For every time, for every season, the Church has her reasons for her practices. It’s a lesson we can duplicate in our own lives, to our great profit. What I remember most about the next morning, at Father’s first Mass, is what a pro he seemed to be. Let me explain. On a natural level, one might expect that a priest at his first Mass may proceed very slowly, so as not to chance messing anything up. And of course, apart from all the Masses he has served and assisted at, not just from the pew but in his capacity as a cleric, Father is familiar with the ceremony. He’s also been observed by clipboard-wielding RCI clergy during “Dry Mass” practices in the months prior to this day. Yet, he was calm, composed, and completely in charge, as if this was something he did every Sunday, and I think that’s a fine testament to the transformation that MHT Seminary works in their young men, and why it attracts those young men from all around the world. Despite the sheer number of languages being spoken - Bp. Sanborn gave the sermon at that first Mass first in Italian, then in French, and a few of the IMBC seminarians spoke with me in English, and MC of the Ordination Mass Luke Petrizzi was giving instructions in Latin (as an aside, as I asked about certain particulars on the morning of the ordination, he assured me, saying “After the consecration of a bishop, it’s nowhere near as hard.” I tried not to laugh as we were in the sanctuary, but there are few things more complicated that a consecration of a new bishop, though he had just helped execute that a few months before), I felt as I almost always do at these ceremonies: at home with Catholics, doing as Catholics have done for generations: celebrating the addition of a new Priest of Jesus Christ. The videos of both the Ordination Ceremony and the First Mass are available to our TR Annual Members and we hope to provide some free excerpts on YouTube for the general public in the months ahead. In the meantime we ask you to join our prayers for Fr. Dutertre in his apostolate, wherever it may take him. Indeed, he did not take any personal days, but almost immediately returned to North America after his First Mass.